Birth, marriage and death registrations of Thomas, Alexander's son, his marriage to his first wife Violet Yule and second wife Elizabeth Gilchrist are included as are the birth and sadly, in two cases, the early deaths of two of his children. Census records are also here. Thomas first worked as a leadminer at Woodhead but later moved to Benquhat near Dalmellington to work as an ironminer and on his death certificate in 1907 he was a coalminer. 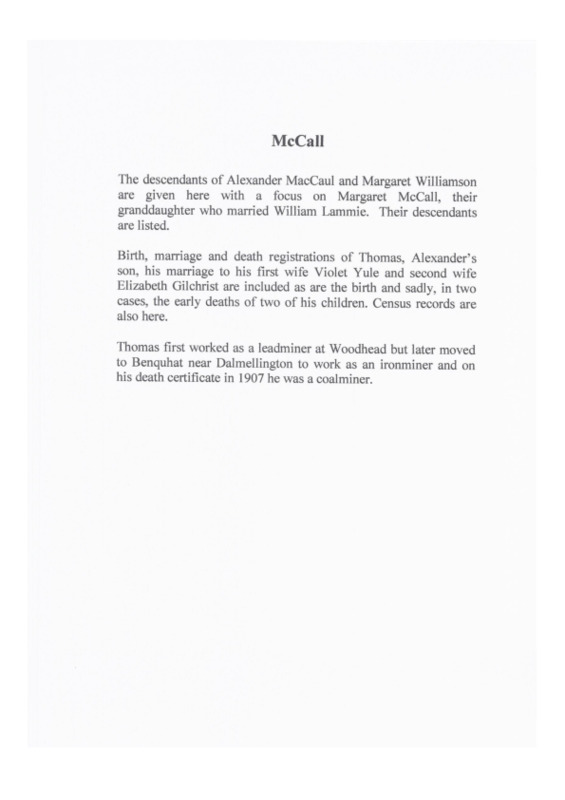 IS, “McCall Family History,” Carsphairn Archive, accessed April 19, 2019, http://carsphairn.org/CarsphairnArchive/items/show/79.